Knee dislocations are uncommon. A knee dislocation is defined as complete displacement of the tibia with respect to the femur (see the image below), with disruption of three or more of the stabilizing ligaments. [2, 3] Small avulsion fractures from the ligaments and capsular insertions may be present. Knee dislocations. Lateral radiograph of anterior knee dislocation. Knee dislocation requires injury to at least three of the four main ligaments. The popliteal artery is relatively fixed proximally as it exits a fibrous tunnel at the level of the adductor hiatus, enters the popliteal space, and then is again tethered distally under the soleus. When the knee dislocates, the popliteal artery is stretched and vulnerable to injury. Popliteal artery injury occurs in up to 53% of patients with knee dislocations. Fractures about the knee are fairly common in knee dislocations. These can be severe periarticular fractures, commonly tibial plateau fractures or ligamentous and tendinous avulsion fractures. Few data exist on the true incidence of these fractures, in that many reports do not mention them. One unpublished study noted a 35% (eight of 23 cases) incidence of fractures associated with high-velocity knee dislocations (Owens, unpublished data, 2003). The presence of the fracture may alter management and require supplemental bony fixation or may allow ligamentous repair versus reconstruction. Multiple ligament injuries are required for knee dislocation. Generally, both cruciates and one or both collateral ligaments are injured. However, knee dislocations have been described with one of the cruciates intact. It is important to evaluate the competence of each ligament and to consider the possibility of a knee dislocation in knees with three or more ligaments torn. Vigilance is required because of the high incidence of neurovascular injuries associated with knee dislocation (vascular injuries 5-79%, nerve injuries 16-40%). An anterior knee dislocation usually results from a hyperextension injury to the knee that initially tears the posterior structures and drives the distal femur posterior to the proximal tibia. A posterior knee dislocation usually results from a direct blow to the proximal tibia that displaces the tibia posterior to the distal femur. Valgus forces cause medial dislocations. Varus forces cause lateral dislocations of the knee. Rotational or rotatory dislocations are the result of indirect rotational forces, usually caused by the body rotating in the opposite direction of a planted foot. Rotatory dislocations can be of four different types, named for the direction of the displaced tibial plateau. For example, posterolateral rotatory dislocation describes a posterior position of the lateral tibial plateau and is the most common rotatory dislocation reported. Knee dislocations can also be classified as either open or closed and as either reducible or irreducible. Most knee dislocations are the result of high-energy injuries, such as motor vehicle or industrial accidents. They also can occur with low-energy injuries, such as those that occur in sports. The reported mechanisms of injury are variable, but the most common are motor vehicle accidents (50-60%), followed by falls (30%), industrial-related accidents (3-30%), and sports-related injuries (7-20%). The true incidence of knee dislocations is higher than reported because as many as 50% of knee dislocations spontaneously reduce before patients present to the emergency department. Multiple outcome studies after surgical intervention for knee dislocation universally report that patients rarely claim that their knee function is normal. [9, 10] Wascher reported results after ACL reconstruction, PCL reconstruction, or both in 13 patients with knee dislocations, and results after a mean of 38 months follow-up care. One patient claimed his knee felt normal, six returned to unrestricted sports activities, and four returned to modified sports. Shapiro reported the outcome after allograft reconstruction of the ACL and PCL after traumatic knee dislocation. Seven patients had an average of 51 months follow-up care postoperatively. Only one patient had significant pain, three had occasional or rare sensations of knee instability, and all seven were able to return to work or school. Four patients required knee manipulation at an average of 16.8 weeks postoperatively for knee arthrofibrosis. The functional grading was excellent in three, good in three, and fair in one. Yeh reported the outcome after arthroscopic reconstruction of the PCL with open repair of collateral ligaments and capsule in 23 patietns followed for a mean of 27 months. At the latest follow-up visit, the mean knee extension was 1° and knee flexion was 129.6°. Mohseni M, Simon LV. Dislocation, Knee. Treasure Island, FL: StatPearls; 2017. [Full Text]. Girgis FG, Marshall JL, Monajem A. The cruciate ligaments of the knee joint. Anatomical, functional and experimental analysis. Clin Orthop Relat Res. 1975 Jan-Feb. (106):216-31. [Medline]. Seroyer ST, Musahl V, Harner CD. Management of the acute knee dislocation: The Pittsburgh experience. Injury. 2008 Jul. 39(7):710-8. [Medline]. Wood MB. Peroneal nerve repair. Surgical results. Clin Orthop Relat Res. 1991 Jun. (267):206-10. [Medline]. KENNEDY JC. COMPLETE DISLOCATION OF THE KNEE JOINT. J Bone Joint Surg Am. 1963 Jul. 45:889-904. [Medline]. Frassica FJ, Sim FH, Staeheli JW, Pairolero PC. Dislocation of the knee. Clin Orthop Relat Res. 1991 Feb. (263):200-5. [Medline]. Sillanpää PJ, Kannus P, Niemi ST, Rolf C, Felländer-Tsai L, Mattila VM. Incidence of knee dislocation and concomitant vascular injury requiring surgery: a nationwide study. J Trauma Acute Care Surg. 2014 Mar. 76 (3):715-9. [Medline]. Eranki V, Begg C, Wallace B. Outcomes of operatively treated acute knee dislocations. Open Orthop J. 2010 Jan 19. 4:22-30. [Medline]. [Full Text]. Oetgen ME, Walick KS, Tulchin K, Karol LA, Johnston CE. Functional results after surgical treatment for congenital knee dislocation. J Pediatr Orthop. 2010 Apr-May. 30(3):216-23. [Medline]. Wascher DC, Becker JR, Dexter JG, Blevins FT. Reconstruction of the anterior and posterior cruciate ligaments after knee dislocation. Results using fresh-frozen nonirradiated allografts. Am J Sports Med. 1999 Mar-Apr. 27(2):189-96. [Medline]. Shapiro MS, Freedman EL. Allograft reconstruction of the anterior and posterior cruciate ligaments after traumatic knee dislocation. Am J Sports Med. 1995 Sep-Oct. 23(5):580-7. [Medline]. Yeh WL, Tu YK, Su JY, Hsu RW. Knee dislocation: treatment of high-velocity knee dislocation. J Trauma. 1999 Apr. 46(4):693-701. [Medline]. Taylor AR, Arden GP, Rainey HA. Traumatic dislocation of the knee. A report of forty-three cases with special reference to conservative treatment. J Bone Joint Surg Br. 1972 Feb. 54(1):96-102. [Medline]. Zoys GN. Knee dislocations. Orthopedics. 2001 Mar. 24(3):294-9; quiz 300-1. [Medline]. Shearer D, Lomasney L, Pierce K. Dislocation of the knee: imaging findings. J Spec Oper Med. 2010 Winter. 10 (1):43-7. [Medline]. Kaufman SL, Martin LG. Arterial injuries associated with complete dislocation of the knee. Radiology. 1992 Jul. 184(1):153-5. [Medline]. Lynch K, Johansen K. Can Doppler pressure measurement replace "exclusion" arteriography in the diagnosis of occult extremity arterial trauma?. Ann Surg. 1991 Dec. 214(6):737-41. [Medline]. Applebaum R, Yellin AE, Weaver FA, et al. Role of routine arteriography in blunt lower-extremity trauma. Am J Surg. 1990 Aug. 160(2):221-4; discussion 224-5. [Medline]. Bui KL, Ilaslan H, Parker RD, Sundaram M. Knee dislocations: a magnetic resonance imaging study correlated with clinical and operative findings. Skeletal Radiol. 2008 Jul. 37(7):653-61. [Medline]. Weber-Spickschen TS, Spang J, Kohn L, Imhoff AB, Schottle PB. The relationship between trochlear dysplasia and medial patellofemoral ligament rupture location after patellar dislocation: an MRI evaluation. Knee. 2011 Jun. 18 (3):185-8. [Medline]. Hill JA, Rana NA. Complications of posterolateral dislocation of the knee: case report and literature review. Clin Orthop Relat Res. 1981 Jan-Feb. (154):212-5. [Medline]. Jones RE, Smith EC, Bone GE. Vascular and orthopedic complications of knee dislocation. Surg Gynecol Obstet. 1979 Oct. 149 (4):554-8. [Medline]. McCutchan JD, Gillham NR. Injury to the popliteal artery associated with dislocation of the knee: palpable distal pulses do not negate the requirement for arteriography. Injury. 1989 Sep. 20(5):307-10. [Medline]. Treiman GS, Yellin AE, Weaver FA, et al. Examination of the patient with a knee dislocation. The case for selective arteriography. Arch Surg. 1992 Sep. 127(9):1056-62; discussion 1062-3. [Medline]. Kirby L, Abbas J, Brophy C. Recanalization of an occluded popliteal artery following posterior knee dislocation. Ann Vasc Surg. 1999 Nov. 13(6):622-4. [Medline]. Patterson BM, Agel J, Swiontkowski MF, Mackenzie EJ, Bosse MJ. Knee dislocations with vascular injury: outcomes in the Lower Extremity Assessment Project (LEAP) Study. J Trauma. 2007 Oct. 63(4):855-8. [Medline]. Bonnevialle P, Chaufour X, Loustau O, Mansat P, Pidhorz L, Mansat M. [Traumatic knee dislocation with popliteal vascular disruption: retrospective study of 14 cases]. Rev Chir Orthop Reparatrice Appar Mot. 2006 Dec. 92(8):768-77. [Medline]. Thomsen PB, Rud B, Jensen UH. Stability and motion after traumatic dislocation of the knee. Acta Orthop Scand. 1984 Jun. 55(3):278-83. [Medline]. Hughston JC, Jacobson KE. Chronic posterolateral rotatory instability of the knee. J Bone Joint Surg Am. 1985 Mar. 67(3):351-9. [Medline]. Derby E, Imrecke J, Henckel J, Hirschmann A, Amsler F, Hirschmann MT. How sensitive and specific is 1.5 Tesla MRI for diagnosing injuries in patients with knee dislocation?. Knee Surg Sports Traumatol Arthrosc. 2017 Feb. 25 (2):517-523. [Medline]. Mariani PP, Santoriello P, Iannone S, Condello V, Adriani E. Comparison of surgical treatments for knee dislocation. Am J Knee Surg. 1999 Fall. 12 (4):214-21. [Medline]. Bin SI, Nam TS. Surgical outcome of 2-stage management of multiple knee ligament injuries after knee dislocation. Arthroscopy. 2007 Oct. 23(10):1066-72. [Medline]. Hirschmann MT, Zimmermann N, Rychen T, Candrian C, Hudetz D, Lorez LG, et al. Clinical and radiological outcomes after management of traumatic knee dislocation by open single stage complete reconstruction. BMC Musculoskelet Disord. 2010 May 27. 11(1):102. [Medline]. Sisto DJ, Warren RF. Complete knee dislocation. A follow-up study of operative treatment. Clin Orthop Relat Res. 1985 Sep. (198):94-101. [Medline]. Noyes FR, Barber-Westin SD. Reconstruction of the anterior and posterior cruciate ligaments after knee dislocation. Use of early protected postoperative motion to decrease arthrofibrosis. Am J Sports Med. 1997 Nov-Dec. 25(6):769-78. [Medline]. Moatshe G, Dornan GJ, Ludvigsen T, Løken S, LaPrade RF, Engebretsen L. High prevalence of knee osteoarthritis at a minimum 10-year follow-up after knee dislocation surgery. Knee Surg Sports Traumatol Arthrosc. 2017 Dec. 25 (12):3914-3922. [Medline]. Whelan DB, Dold AP, Trajkovski T, Chahal J. Risk factors for the development of heterotopic ossification after knee dislocation. Clin Orthop Relat Res. 2014 Sep. 472 (9):2698-704. [Medline]. [Full Text]. Knee dislocations. MRI showing significant disruption medially and laterally with tibial bone bruise. Knee dislocations. Examination under anesthesia revealing recurvatum and lateral ecchymosis. Disclosure: Received educational program support from Pacific Medical for none. The authors and editors would like to acknowledge Margaret L Olmedo, MD, for the contributions made to this article. 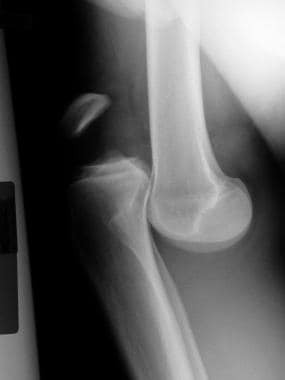 Fast Five Quiz: Are You Prepared to Confront Knee Dislocations?